Slice oranges into cross-sections, each about 1/4 inch thick. Arrange a layer of orange slices in the bottom of the dutch oven, saving 6 slices. Pour water into the dutch oven. Lay salmon fillets on orange slices with the salmon skin side down. Sprinkle dill weed over the salmon. Be generous. 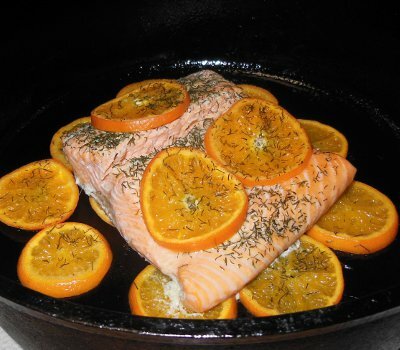 Place 6 orange slices on top of salmon fillets. Put lid on the dutch oven and Bake at about 350 degrees for about 30 minutes. Use a fork to poke through the center of a fillet to check for doneness. Move the fork so you can see the coloring of the meat on the inside. The meat should be the same opaque color throughout. A slightly darker color in the center is ok, but not translucent like it was before cooking. Let me know how you enjoyed your Simply Salmon!